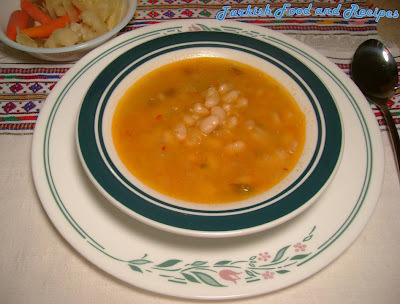 White Beans is a very traditional and common dish in Turkey, especially when it is served with pilaf and pickles. 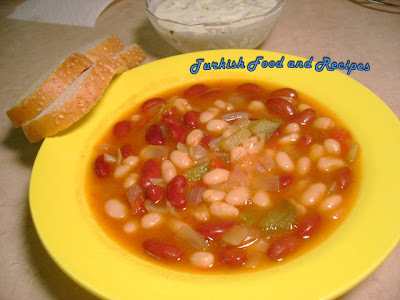 Turkish people just love this dish. Wash white beans, place them in a pot and cover with water (approximately 1 inch above the beans). Leave them in water overnight or for at least 12 hours. The next day, cook them with the same water till beans get soft over low heat. You could add baking soda to have softer beans quicker. When they are soft, add 1 tsp of salt. In another pot, sauté onions with oil for 2-3 minutes over medium heat. Stir in peppers and tomato paste. Saute for 2-3 minutes and add chili red pepper flakes (optional). Transfer the cooked white beans over them. Simmer for 10-15 minutes over low heat. Serve White Beans, with pilaf or over pilaf. Also cacik and pickled vegetables are good to go with this recipe. P.S: You can also use 2 cans of white beans and skip the instructions given in the first paragraph, but it may not be as delicious as the one with dried beans. Also, you can use or mix kidney beans, black beans or pinto beans for this recipe. ***This is a vegetarian recipe. Kuru fasulye Turkiye’ nin geleneksel yemeklerinden biridir. Ozellikle pilav ve tursu ile servis yapildiginda genelde butun Turklerin sevdigi bir yemektir. Aksamdan kuru fasulyeyi yikayin ve bir tencereye koyup uzerini 2-3 parmak kaplayacak kadar su ile doldurun. En az 12 saat bekletin. Sonra ayni su ile kuru fasulyeler yumusayana dek pisirin. Isterseniz 1 cay kasigi karbonat ilave edip fasulyelerin daha kisa surede yumusamasini saglayabilirsiniz. Pismeye yakin 1 tatli kasigi tuz ilave edin. Diger bir tencerede yag ile sogani kavurun. Sonra salcayi ve biberleri ilave edip 2 dakika daha kavurun. Kirmizi pul biberi ilave edin (istege bagli). Sonra pisirdiginiz kuru fasulyeleri soganlarin bulundugu tencereye transfer edin. Hafif ateste 10-15 dakika kadar pisirin. Kuru Fasulyeyi pilav ile ya da pilav ustu servis yapin. Yaninda cacik ya da tursu ile guzel olur. NOT: Bu tarifi 2 kutu konserve kuru fasulye ile ilk paragraftaki uygulamalari atlayarak da yapabilirsiniz, fakat konserve ile yapinca aradiginiz lezzeti bulamayabilirsiniz. Ayrica bu tarif icin siyah fasulye ya da barbunya da kullanabilir veya renkli bir gorunum icin karisik da yapabilirsiniz.